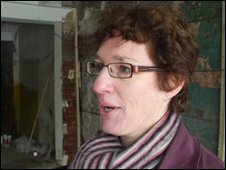 A month after the historic town of Cockermouth was devastated by floods, the BBC's Fiona Trott revisits Main Street, which bore the brunt of the destruction. The skips are still here, but at least the floodwater has gone, and with it, the smell of river and rotting wood which plagued every shop, restaurant and pub here. But the soggy clothes, books or furniture that once filled these skips have now been replaced by shelves, bricks and plasterboard. The business owners have stopped salvaging their stock and have started to repair and restore what the River Cocker left behind. Last month, The New Bookshop was a big soggy mess. Books and cards were strewn across the floor. Today, there are no books, no shelves - nothing. Instead, the shop has been stripped back to its bare walls. Its owner, Catherine Hetherington, said her work had only just begun. "This floor has recently been put down, and we'll have the driers in all next week. After that, we're basically starting from scratch because we lost everything," she said. She showed us a small book - a compilation of photographs taken during the rescue operation and in the days following the floods. For every copy sold, £2 will be shared between the Cumbria Flood Recovery Fund and the Cockermouth Mountain Rescue Team. The book brought back memories for Ms Hetherington. She said: "It's very difficult to believe it ever happened. 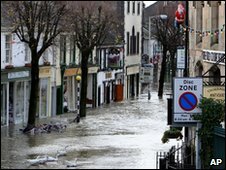 The speed at which it happened and the devastation it caused... to have had our own shop under 6ft of water... it's like a bad dream." Like most of the shop owners on Main Street, Ms Hetherington is an independent trader. She is not part of a huge bakery or chemist chain (which have quickly re-opened two of the shops here). So, she and others have thought of a different way to make money whilst the shop doors are shut. They have set up a temporary store in the local auction house instead - and it is buzzing. The spare rooms are filled with brand new merchandise and there are Christmas decorations on the walls. They say business is good. 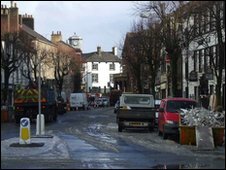 For years, Christmas shoppers have always come to Cockermouth because the shops are individual, but you cannot help but wonder if they are busier than normal because people want to show their support. 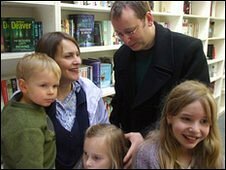 In the auction house, the Short family are browsing some children's books. We spoke to Emmie and her husband Guy one month ago, when they were rescued from their home. The floodwater was coming in so fast, that they had to push all three children through a tiny window and into the hands of the Mountain Rescue Team outside. Mrs Short said: "It was very bizarre, especially for our two-year-old, who had no coat or shoes. We just handed them to a stranger. "It was peculiar to us, to see them being taken away. Even though we knew they were safe, it still felt very odd handing them over like that." The Short family cannot stay in Cockermouth for Christmas, because their temporary accommodation is no longer available, so they are heading south to spend it with relatives instead. Mrs Short said: "The older children are coping well, but our two-year-old son is finding it a bit bewildering. He keeps telling everyone 'our house is broken. Bob The Builder is going to fix it'." Like most people here in Cockermouth, Mrs Short talks about "a new normal" - a new unfamiliar way of living, like singing carols above the constant hum of drying equipment, or seeing Christmas lights hanging above boarded-up businesses. It will be months before this historic town gets back to the "old" normal, but for the people staying here, celebrating Christmas together will at least bring them something familiar.